Nothing says summer like a big scoop of ice cream. Now imagine a house-made version of those molten, campfire-roasted marshmallows of your youth perched atop your favorite flavor, served in a warm waffle cone made to order. That’s summer cubed. 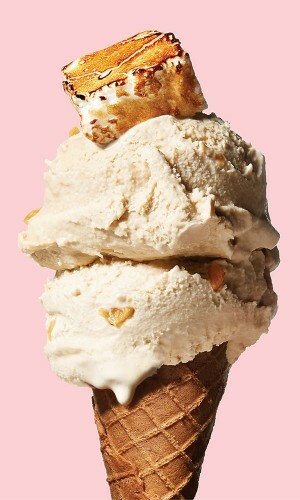 Trust us, it’s well worth the extra dollar and pairs perfectly with the bittersweet combination of creamy espresso ice cream studded with snaps of caramel brittle in this photo. For non-coffee lovers, Hello Honey co-owner Nitima Nicely recommends the salted caramel or honey lavender. Nicely and her husband Brian, both committed to scratch cooking, were looking to open a business in 2012 when they stumbled on the ultimate crowd-pleaser—ice cream. “When customers come,” says Nicely, “they don’t feel rushed; they’re happy.” Rest assured, you’ll never leave this shop with a bad taste in your mouth.